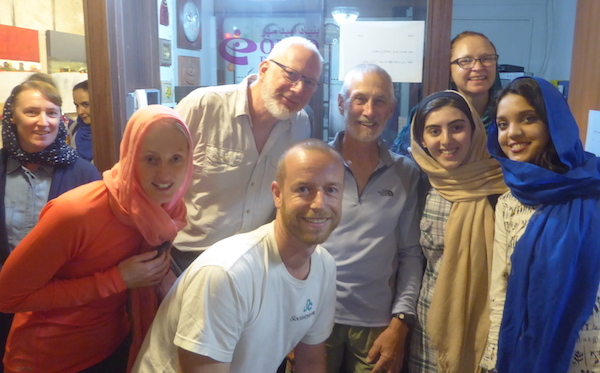 In the second week of April, OMID was visited by a group of cyclists from Australia, who were cycling through Iran to visit Isfahan and Shiraz. The cyclists were on a tour organized by Social Cycles, who run life changing adventure tours that link cycling and visiting local sites whilst connecting with local NGOs. On April 9, Brett Seychell, founder of Social Cycles, visited us and on the next day was joined by the rest of the group. Our visitors took in a tour of our premises, met and talked to some of the young women in our program and on returning home the group made a generous donation of $862, by way of a combination of individual donations and funds raised individually by the participating riders. OMID would like to express our deep gratitude for their generosity. Brett (pictured above in the white t-shirt) first came across OMID when on a previous tour, six years ago. Melbourne born and bred, Brett has spent the last few years cycling across the world from London to Melbourne. As founder of The Kindness of Strangers NGO, Brett spent those years researching NGOs across the globe and financing 13 small projects across six different countries. For more information about Social Cycles and to find out how to take part in their forthcoming trip from Tehran to Shiraz, from September 27 to October 8, please click here to visit their website. To make your own donation to OMID please click here.